Harvey Horrocks giving his public examination at Manjushri Institute, Cumbria, England 1976. By 1974, many students of Lama Yeshe and Lama Zopa Rinpoche had been studying solidly for at least two years at the biannual lam-rim courses held at Kopan Monastery in Nepal. As a result, Lama Yeshe began holding public examinations of his students in December of 1974 to help ensure their thorough Dharma education was being retained. 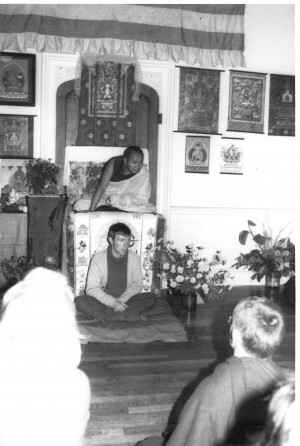 Prior to the first examinations, Lama Yeshe gave a talk to the Sangha of FPMT, known by then as IMI (International Mahayana Institute), in order to prepare them for the first public examinations….